When Viewed: Contents described are those showing when viewed in November 2014. Contents: Athgreany – Ballintober – Ballysize – Blakestown – Britonstown — Broughills Hill – Corragh – Dragoonhill – Drumreagh – Dunboyke – Granamore – Harristown – Hollywood — Hollywood Demesne – Johnstown — Kiernans Hill — Killerk or Athgarvan – Knocknaboley – Knocknadroose – Knockroe — Lockstown Lower — Lockstown Upper – Lugglass – Mullycagh – Newtown – Oakwood – Coonmore – Rathattin – Scalp – Slievecorragh – Toor – Walterstown – Woodenboley. When Viewed: Contents correct as of May 2014. About: The Census returns for the Donaghmore District Electoral Division arranged alphabetically by townland. The 1901 census was taken on 31st March 1901. The 1911 census was taken on 2nd April 1911. Contents: Ballintruer Beg — Ballintruer More — Ballyhubbock Lower — Ballyhubbock Upper — Brusselstown — Castlequarter — Castleruddery Lower — Castleruddery Upper — Castlesallagh — Coolamaddra — Deerpark — Donaghmore — Killybeg — Newtown — Raheen — Randalstown — Whitestown Lower — Whitestown Upper. Publisher / Place of Publication: Anvil Books / 45 Palmerston Road, Dublin 6. 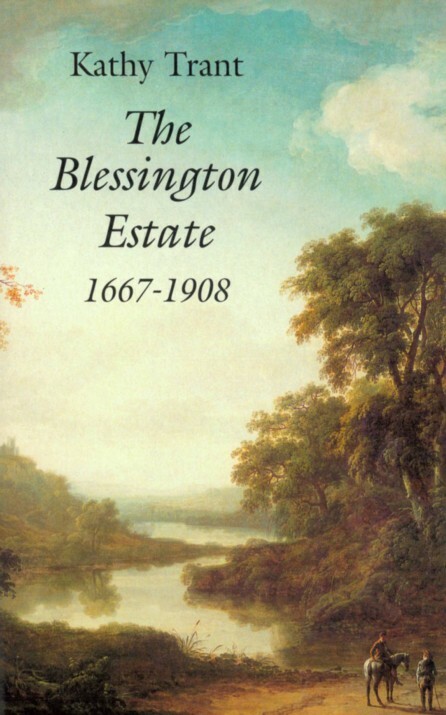 About: The definitive history of the Blessington area from the mid-17th century to the beginning of the twentieth. It combines the story of the Boyle and Hill families of nobility with the eternal tension of the landlord and tenant relationship. The author has researched the subject extensively and the highest levels of scholarship are evident. However, the book is very accessible and a recommended read for local historians. Chapters: Foreword — The Struggle for Land — The Boyle Dynasty — The Downshire Connection — The Rebellion of 1798 — Bad Debts and Good Neighbours — Land Tenure and Agents — The Tenants — Rents and Arrears — The Landlord’s Role — The Famine Years — The Social Round — The Final Chapter — Epilogue — Appendix: List of tenants on the Blessington Estate, 1850 — Acknowledgements — Abbreviations — Notes and Sources — Notes on Illustrations — Bibliography. Extra #1: includes 98 illustrations and images. Extra #4: Read a review of this book online via JSTOR. [Personal registration / conditions apply]. Alternatively, your local public library may provide free online access to this review. Extra #5: For information, a review of this book was also published in the Journal of the County Kildare Archaeological Society, Volume 19 (3), 2004-5 pp568-570. About: The property tax system of 1850’s Ireland. It was the first major attempt at valuing property. This section lists householders in the Parish of Donaghmore, part of the area covered by the Poor Law Union of Baltinglass in West Wicklow. Contents: Ballinabarny — Ballinabarny Gap — Ballinard — Ballinclea — Ballineddin Lower — Ballineddin Mountain — Ballineddin Upper — Ballinfoyle Lower — Ballinfoyle Upper — Ballintruerbeg — Ballintruermore — Ballyhubbock Lower — Ballyhubbock Upper — Ballyreask Ballytoole Lower — Ballytoole Upper — Ballyvoghan — Ballyvraghan — Blackpits — Blane — Brittas — Brusselstown — Bushfield — Camera — Camerahill North — Camerahill South — Cannow — Cannow Mountain — Castlequarter — Castleruddery Lower — Castleruddery Upper — Castlesallagh — Clonshannon — Clornagh — Coan — Colliga — Coolamaddra — Coolmoney — Crissadaun — Davidstown — Deerpark — Derrynamuck — Donaghmore — Drumreagh — Eadestown Hill — Eadestown Middle — Eadestown North — Eadestown South — Fauna — Gibstown — Kelashmore — Kilbreffy — Killybeg — Knickeen — Knockanarrigan — Knockandarragh — Knockaderry — Knockamunnion — Leitrim — Leoh — Levern — Lobawn — Lugnaquillia — Monroe — Moorspark — Moorstown — Newpark — Newtown — Pollaghadoo — Raheen — Randalstown — Rostyduff Lower — Rostyduff Upper — Seskin — Snugborough — Spinans, East — Spinans Hill — Spinans, Middle — Spinans, West — Stranahely — Sugarloaf — Table Mountain — Tinnahinch — Whitestown Lower — Whitestown Upper. Extra #1: Read the entries for GV Donaghmore Parish (pdf file). About: The property tax system of 1850’s Ireland. It was the first major attempt at valuing property. This section lists householders in the Parish of Hollywood, part of the area covered by the Poor Law Union of Baltinglass in West Wicklow. The remainder of the Parish of Hollywood was within the area covered by the Poor Law Union of Naas. Contents: Athgarvan — Athgreany — Ballintober — Ballysize — Bannagroe — Broughills Hill — Conlans Hill — Coonmore — Corragh — Dragoonhill — Drumreagh — Dunboyke — Glebe — Granamore — Harristown — Hollywood Demesne — Hollywood Lower — Hollywood Upper — Johnstown — Kiernans Hill — Killerk — Knocknaboley — Knocknadroose — Knocknastreile — Knockroe — Lockstown Lower — Lockstown Upper — Lugglass Upper — Lugglass Lower — Mullycagh Lower — Mullycagh Upper — Newtown — Oakwood — Rathattin — Scalp — Slievecorragh — Toor — Walterstown — Woodenboley. Extra #1: Read the entries for GV Hollywood Parish within Baltinglass Union (pdf file). When Viewed: Contents correct as of April 2013. About: The Census returns for the Hollywood District Electoral Division arranged alphabetically by townland. The 1901 census was taken on 31st March 1901. The 1911 census was taken on 2nd April 1911. About: A substantial article on the archaeological remains to be found in this area of West Wicklow. The author divides the article into headings such as: Some notes on the early history of the district; Ancient battle sites; Tumuli, raths and moats; Dolmens and stone circles; Standing stones, bullaun stones and other antiquities. When Viewed: Contents correct as of May 2012. About: The Census returns for the Tinahely District Electoral Division arranged alphabetically by townland. The 1901 census was taken on 31st March 1901. The 1911 census was taken on 2nd April 1911. Contents: Ballinacor — Ballynamanoge — Ballyraheen– Ballyhonog/Ballyshonoge — Boleybawn — Bridgeland — Carrick — Churchland — Coalruss — Coolafunshoge — Coolross — Cross — Curraranish/Curravanish — Farnees — Glenphilipeen — Gorteen — Greenhall — Lugduff — Main Street (1911 only) — Mangans — Market Square (1901 only) — Mountpleasant — Mullannaskeagh — Mullans North — Mullans South — Muskeagh — Newtown — Pond Street (1901 only) — Pound Street — Raheenteige — Rosbane — Tinahely — Whitefield — Whiterock.